“‘Arrange themselves’?”, Stephan echoed Maruc and Miklos’ words they read from the ancient tome. “So the priests stood around at certain spots?” Stephan looked around the floor for spots. “I don’t see any spots.” Looking up, “I say we get out of here. The jackal heads up there will know what to do with the tome. Maybe they can stand around in spots. There’s naught else to learn here.” He turned and started up the steps to join Feldard at the top. With that said the dwarf moved back down the stairs to inform the others. “We’re staying the night. Rest while you can we’ll likely have undead visitors during the night.” He began pulling out some dried meat and biscuits from his pack as an evening meal then settled himself down to eat and rest. “Well, Miklos, I see nothing,” a resigned Hasan complained. “Tomorrow, we shall return this text to the Hutakaa and see what they can make of it. When it comes time friends, let me do the talking. And keep those under your wraps,” the elf nodded at the jewels found by the Hutakaan grave. Stephan eyed the door, ensuring that it could at least be barred in a fashion with an ancient but seemingly stout plank of wood left discarded in a dusty corner. Stephan took some measure of comfort from the priest’s words. Maruc, despite wielding remarkable ferocity in battle, could sooth the more grievous of wounds to the soul. It was a restless night in the crypt. The party was troubled by strange ghostly noises, distant wailing and the like. Those who were able to sleep were troubled by nightmares of unseen ancient evil and hordes of undead. At daybreak, they were all quite eager to leave the Hutaakan ruin. Their Hutaakan guides were long gone, but Hasan had no trouble retracing their route back to the Hutaakan village. The normally reserved jackal-headed humanoids actually showed some signs of excitement at seeing their return. Kforedz and her flock assembled to greet the heroes. “Now we must face the dilemma. Can we trust the Hutakaa with this Knowledge? We must, for only they can act on it,” proclaimed Hasan. “But what we seek is the same, and so we should examine this ourselves first. Miklos, help me unbind this, that we may study for an hour or two in the confidence of this tomb. Dead men tell no tales,” Hasan laughed, nodding at the remnants of their opponent. The dwarf, while not pleased at more idleness, knew that the elf prince had a point. “I’ll keep watch up top.” And the dwarf headed back to the entrance of the tomb to keep alert watch while those with the skill, read from tomb to see if it held the knowledge they sought. The clue to why the Sons of Night were so hell-bent on finding this valley – and more importantly, how to stop them. Ludo shrugged his shoulders, “for what its worth, this place gives me the creeps, the presence here of Undead reinforces to me that evil is infecting the land, no wonder the Sons of Night are interested in this place, I suspect they crave the source of power that cloaks this land, the relics here will lead us to them. We had best be on our guard. Maruc if possible I suggest you clense this temple, the creature destroyed will return otherwise. I will wait with Feldard but do not tarry too long, twilight is upon us and we are a long way from safety. Stephan used his lightstone to scan the walls of the crypt. He searched for anything odd about the walls, but saw nothing. He then shined the light in the sepulcher from which the mummy had emerged. He looked over at Hasan and Miklos huddled over the tome. “Can you make anything out?” They ignored the ignorant question. “Any pictures?” Stephan asked with mock eagerness. They treated the ancient pages of the book with care. Unfortunately, it was written entirely in Hutaakan. There were no pictures, per say, but at the end of the book, there were several diagrams, seemingly to describe how priests were to arrange themselves when performing rites and ceremonies. Feldard looked hard at the still burning remains and wrinkled his nose at the terrible smell. He coughed at the stench and smoke. Burying his mouth and nose behind his arm, he strode past its corpse to take a look at the stone case it had emerged from. Feldard would leave the objects on the pedestal just behind him for the mage and priest to look over. “Don’t touch them until Ludo has a chance to check for traps” he warned, as the dwarf noted the humans heading towards the pedestal even as he was thinking exactly that. Stephan retrieved his fallen sword and shield and hastened to direct his lightstone where Ludo needed it. He watched as the rogue took on a cat-like caution in examining not only the objects but the pedestal itself. Snorting, Stephan tried to rid his nostrils of the acrid burnt smell. He was eager to move on. Hasan mused, “So, the complaint grows truer. The dead walk, even in hallowed halls. We must know more.” The elf joined the party’s careful search of the room. After the thorough search was complete, it was clear the only objects of interest were covered in dust on top of the pedestal behind the curtain. There was a ring and a necklace, both made of gold, on either side of a tome, no doubt The Knowledge of the Elders of which they came here to seek. The front cover of the tome was emblazoned with the Hutaakan Holy Star, the symbol of Pflarr. The creature did not retreat. Feldard had no experience with such an undead before. But what he did know was that all other undead fell readily enough under the onslaught of his axe, so while Ludo urged retreat, Feldard pressed forward to meet this ‘mummy’ full on. He had his armor now.. the thing was little more than walking bandages.. it didn’t even carry a weapon. This should be easy. “Don’t go far my friends, I’ll be done with it in a minute or so.” How clueless he was. Sure, with its slow lumbering, the dwarf was able to get first strike, and by the dwarfs reckoning it should have been a good one too. However, the thing before him barely acknowledged the gaping wound to its bandage-covered corpse before swinging at him in return. It is fortunate that Feldard’s armour blocked the majority of the blow ,but the strength behind it threw the dwarf into a nearby wall, knocking his breath from him. Feldard shook his dizzied head back into focus as he pushed away from the wall unsteadily. Ok.. maybe not so easy to fight. Stephan was initially relieved to allow Feldard to take care of the, what was it Ludo called it? A mummy? He lingered back as a reserve troop as Feldard closed on the mummy. Stephan stifled a yell when he saw the dwarf hurled so easily across the room. “For Feldard!” Stephan bellowed as he engaged the musty undead with is sword. 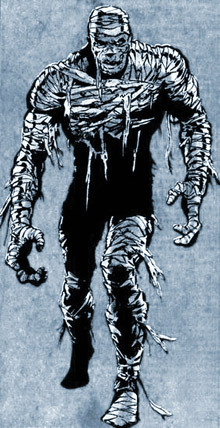 With the bandage-wrapped monstrosity momentarily trapped, Stephan was able to land two strikes on the mummy. He felt the blows were sound but the impact of it felt strange and did not have the devastating effects he’d hoped. This momentary surprise cost him dearly as the mummy grabbed at his sword–no blood, no pain–and wrenched it from his grasp. The blade clattered across the stonework. Faster than expected, the mummy finished its attack with a roundhouse pummel that, like Feldard, sent Stephan sprawling. It was all he could do to roll to his feet. Unshielded–somehow, his shield had come loose and now lay useless on the flagstones. In one fell swoop, the mummy had managed to completely disarm him. He was grateful, laughingly, to still be wearing his chainmail. Hasan swung brazenly, oblivious to the danger. The elf’s glad whistled through the air and sliced neatly through the tattered cloth. The mummy turned unhurriedly toward yet another attacker, stretching his arms out to wring Hasan’s slender neck. “Clear the way prince!” Miklos called. The elf leaped and rolled away. The mage had been waiting for an opening, and now with the warriors out of the way, he cast a web spell and snared their frightening foe. They did not have much time for the creature’s claws were already hard at work slicing through the webbing. They quickly stabbed the bundle of webs and wrappings with their torches, and it quickly came ablaze. The horror was a threat no more. Hasan winced as he heard the sounds rise up from below a third time. “No mistaking it, is there?” he asked tentatively. The elf’s companions saw his concentration drift away and heard soft tones of an ancient Elvish melody emerge under the elf’s gulping breaths. “Well what are we waiting for?” the dwarf inquired from his position at the back, as the party seemed to hesitate before the open doorway. “The way forward has opened. That is what we wanted, right? Lead the way on, or I shall.” Feldard stated impatiently. Yes, he could hear the sound of stone on stone from far below. From the sound of it, whatever was moving, was quite large. In fact, in some ways, it reminded him of the statues they’d faced earlier at the entrance to the Valley itself. That there might be other stonework trials to pass wasn’t surprising to the dwarf. The thief approached the perimeter of the stairwell. The distinct of death and decay wafted up from below. He did not find any traps. Feldard’s pragmatic impatience did much to dispel the foreboding feeling that had been growing in Stephan. The heavy-sounding, stone-on-stone grating echoed about the chambre. “Da,” the Traladarian said as some sort of declaration. “Sounds like more stone portals opening for us. We are bidden to go forth.” Yet, he made no move to actually lead the party into the depths. He looked to Miklos, who prominently held the rod. While he waited for the mage to begin the groups’ descent, he got out his light stone, fixing it into the wire contraption he’d devised on his helm. There. Now he stood ready to enter the gloom. The cave was a dry one, at least at this level, with none of the wonderous cave formations he’d seen in the Valkos Mountains years ago. Good, he thought. He preferred, all things considered, remaining dry. He checked, however, his flask to see how full it was and was happy to discover it brimming. Another, very distant, stone grating sound beckoned the companions. This time, however, there seemed to be more of a cracking quality to the cave’s voice. “This hole is speaking to us. I don’t speak cave.” His words, though absurd, nonetheless somehow made sense. They moved cautiously down the ancient steps for thirty feet. At last they reached the vault, a 20-foot square chamber. A half-opened stone coffin was in the center of the room. It was etched with the familiar geometric pattern motif, identifying it as of Hutaakan origin. Behind the coffin at the rear of the room was a pedestal with some dust-covered objects upon it. The lid slowly slid completely off the coffin, falling to the floor with a loud thud. A heavily decayed, bandage-swathed creature crawled its way out of it. Ludo gazed into the gloom at the dark figure and held his torch higher to cast more light into the room and to clear away any cobwebs within his vicinity. “Come on Miklos, lets get what we came for and leave”. The dwarf took note of the artwork for a moment. “I’m getting an inkling now of why the Sons of Night are so interested in this place,” he commented drily as he positioned himself by the entrance, facing outward – keeping watch behind the group while Miklos decided how best to proceed. Stephan too took in the dramatic artwork. “I’m just a simple soldier, but I’m getting the feeling that Hasan needs to take the rod.” As he spoke, the woodsman maneuvered away from the side of the chamber that depicted the dark figure. He could not look long at the figure as its blackness seemed to draw him in. Icy tendrils seemed to envelop his heart. He gritted his teeth, forcing himself to look away from the dark silhouette. He noted the Hutaaka seemed to be gone for the most part; having positioned themselves just outside the doors to the vault. Hefting his sword and shield, he looked to Miklos who had a wondrous look on his face as he gazed at the rod. A stone trapdoor behind a large altar opened at Miklos’s command. 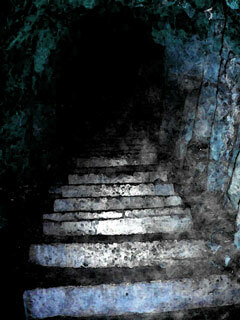 Steep, ancient steps lead down into the gloom. For a few moments, nothing could be heard except the sound of the party’s own anxious breathing, but then a sound from below, like stone grating on stone broke the silence. “We shall wait outside and watch for your return,” said a priest with shame and fright in his voice. The pair of Hutaakans retreated quickly away to a short distance away. “Come friends let us see what horrors lie below.” Withdrawing his lightstone, Maruc boldly stepped into the archway and allowed his gaze to become accustomed to the gloom. Miklos was less eager to enter but allowing the bulky woodsman to go before him, he followed behind. “Rather lovely, isn’t it,” Hasan mused, taking a final peak at the temple’s facade that filled with gentle sworls, intersecting angles and the occasional hints of centuries-old pigments. “You really should think about painting it again,” he started to complain to the Hutakaa, then remembered that they had been too frightened to enter. He joined Maruc in crossing the threshold. The elf stood quietly and waited for his eyes to adjust to the darkness. Standing at the top of the stairs Ludo thought the Vault looked and felt like a tomb. He shivered and followed Miklos and Stephan down the stairs, At the bottom he muttered, “This place has the feel of death, tread carefully”. Fishing into his pack, he pulled out and lit a torch. With the priest and elf in the lead, Feldard knew he’d be best served guarding the party’s backs, so he took up his rearguard position and kept watchful eye behind as the group entered the shrine. His dwarven eye for stonework took in the details of the shrines structure. The art inside the shrine was of the same style as other Hutaakan relics, but the content was different from any other works they had seen. The interior walls were a panoramic the Hutaakan valley with a large temple in its center. The walls were split into two themes. To one side of the temple, the valley was bright and glorious. It featured an elf bearing a magic rod, riding upon a golden dragon into the valley toward a large Hutaakan temple. The other half was dark and wretched, with undead creeping everywhere across the landscape. In the center of the dark half of the valley, diametrically opposed to the elf, was a dark figure, entirely depicted as a black silhouette. Stephan was not sure whether or not it was acceptable for him to draw his sword. Despite this place being a shrine, it nonetheless held a great sense of foreboding. He drew his sword taking his place among his comrades. Miklos felt a tingling sensation emanating from the rod. It was ready to fulfill its purpose.